Many kitchen designers have used specialized software to make designs fairly quickly. The main benefit of this type of software is its catalogue of kitchen cabinets, as well as the instant pricing information. However, SketchUp is a very powerful tool that can be used for this type of task. 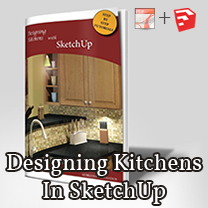 SketchUp contains vast library collections that can be found in the 3D Warehouse, the low-cost investment in software needed (even free), and versatility of designs and materials available to apply on surfaces. Any custom design can be approached in a simple way, and designers can grow their own libraries for future use. 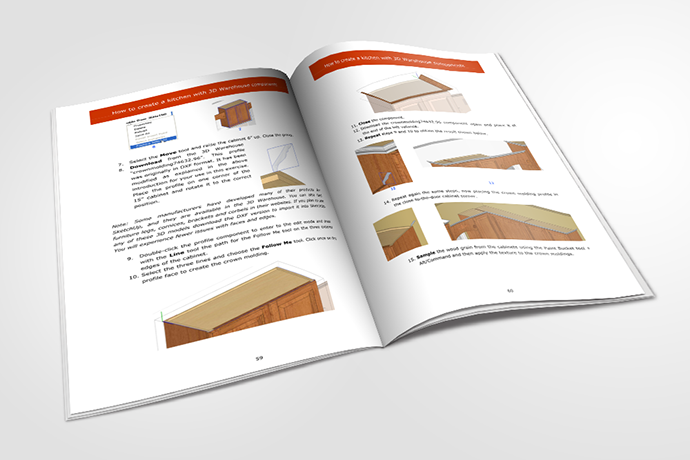 In this book you will learn how to drag and drop cabinets that are different sizes, select the door style and finishes, and use plugins to create new components in the blink of an eye. You will also learn other topics such as how to create your own dynamic components with the ability to change size, material and dimensions or create a fast design using pictures or images. If you wonder how you can choose certain items a cabinets company offers, and how to get the detail of the door style and color you want, you will find those answers in this book. Tiles, backsplashes, countertops and a quick exploration adding lighting effects to designs with freeware and shareware alternatives will complete the knowledge you need to succeed in your daily professional life.